The Shuman Gulch trail is located in the La Sal Mountains near Moab, Utah. 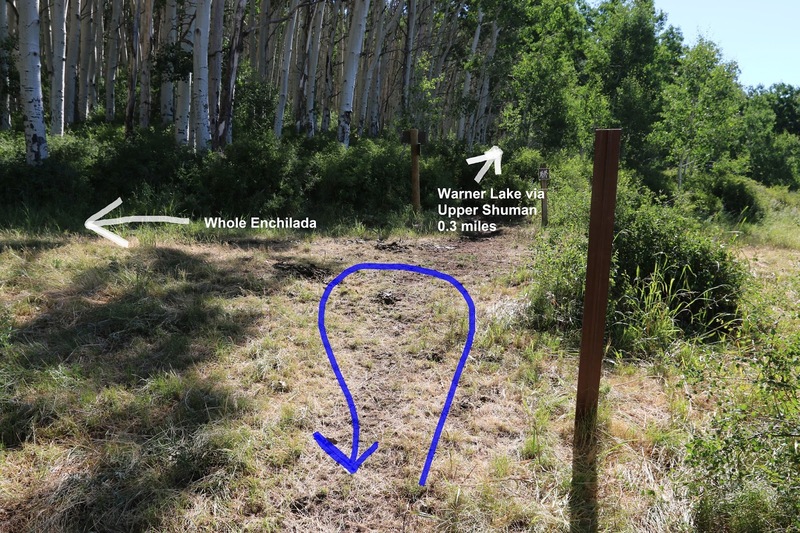 The trail begins off of the Oowah Lake Road and climbs the lower stretch of Shuman Gulch to the Hazard County trail. From there the Upper Shuman trail can be followed for another quarter mile or so to get to Warner Lake and the Warner Campground. To get to the trailhead from Moab drive south on Highway 191 measuring 7.8 miles from Center and Main. Turn left onto the Old Airport Road and follow the signs for the La Sal Mtn. Loop. Follow the La Sal Mtn. Loop for 12.3 miles and turn right at the sign in this photo just before crossing Mill Creek. 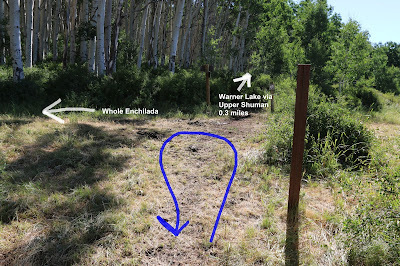 After turning onto Forest Road 0076, the Oowah Lake Road, reset your odometer and measure 1.04 miles to the Shuman Gulch trail sign in this photo. The sign sits below the level of the road on the north side and is not at all obvious unless you are looking right at it. There is a little room to park at the corner just past the sign but a better spot is 50 yards or so on up the road where there is a pull through on the south side of the road. From the roadway the trail drops down and almost immediately crosses Mill Creek. Mill Creek is swift and almost boot deep even in the middle of the summer. Mountain bikes won't have much trouble with it but hikers are going to get their feet wet. We didn't bother fighting the brush and searching for an easier crossing either upstream or downstream. Right after crossing Mill Creek there is another crossing that is much shallower of the stream that flows down Shuman Gulch. After crossing that stream there is an irrigation ditch but it runs through a culvert so no problem with that. From there the trail begins its climb up the gulch through tall stands of aspen trees and a lush undergrowth of brush and wildflowers. There are a few minor rock ledges but for the most part the trail is black dirt with some occasional roots. There is also one more small stream crossing where the rocks are more of a bother than the water itself. Someone made a trail marker out of an aspen tree. The letters and the arrow are still readable but the tree scab above them looks more like a belly button. It is interesting the way the bark on aspen trees envelops a tree scab whereas on a pine tree all they seem to do is secrete sap or pitch. The trail gets slightly steeper as it passes through the band of rock that forms a cliff line along the mountainside. It remains steeper for a short distance afterwards as it makes its last umph to gain elevation. Eventually the trail levels off somewhat when it gets up on top of the shoulder of the ridge. There are some nice views in places where the trail gets near the edge of the forest. For the last section of the trail you couldn't ask for anything much more pleasant to hike or bike through. Near the 1.5 mile point the trail meets up with what looks like a road and comes to an end. You can continue straight ahead for another third of a mile of easy trail and reach Warner Lake. Following the road to the left will lead out to the Warner Lake Road after another third of a mile also. The trail sign at the beginning said that it was 1.5 miles to Warner Lake but that isn't really the case. One never knows what is going to be watching them in the forest. Today it happened to be a very large falcon. The hike back down Shuman Gulch is pretty pleasant other than having to cross Mill Creek once again. In this photo you can see the pull through where we parked that we mentioned earlier. 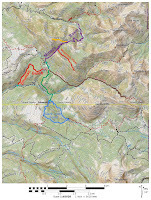 A loop can be made by combining the Shuman Gulch and Oowah Lake trails with a section of the Oowah Lake Road. It should come out to about 4.5 miles. It is probably a toss up which direction would be easier. 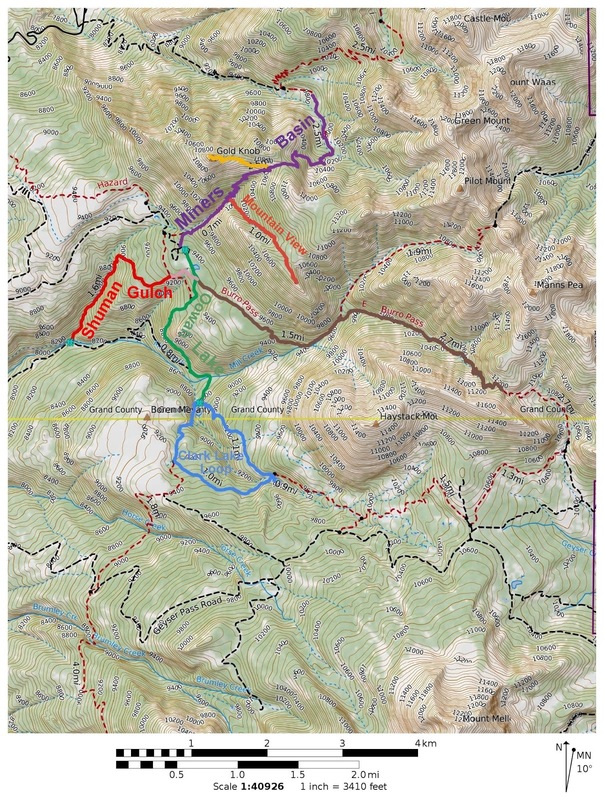 I would be inclined to ride up Oowah and down Shuman Gulch. As far as the Shuman Gulch trail by itself goes, if you would like to see it for yourself then all you have to do is grab your bike or 'Take a hike'.